Holed up in the bar at Yellowstone’s Mammoth Hot Springs, I was trying to finish some work on my laptop so I could finally devote full attention to a fall fly fishing trip. On the grass surrounding the historic hotel, massive bull elk warily guarded their harems like kings. The evening air was filled with their haunting bugles. Tourist hordes had evaporated; things were getting wilder. 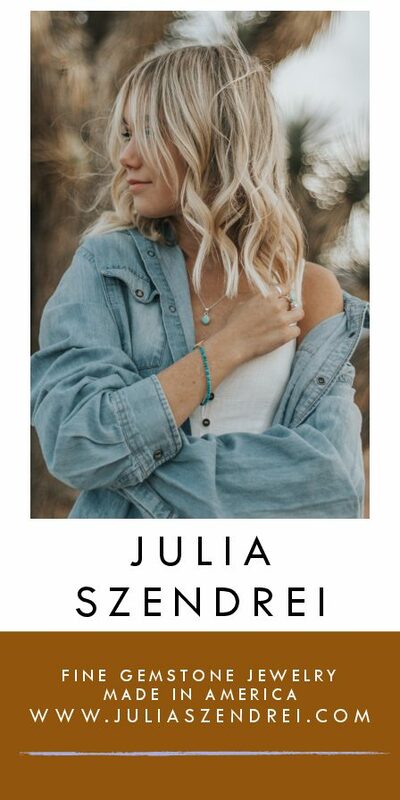 I ordered a glass of Zinfandel and studied the gray clouds outside the window, which were growing denser and dropping lower on the mountainsides rearing above the Gardner River far below. Zeus was angry: summer’s last booming thunder, rain, then temperatures dropping into the 40s. The next morning there was new snow on Sepulcher Mountain above the steaming travertine terraces. It was perfect weather for fleece and fall Blue-wing Olives but I stubbornly retained my summer groove, stupidly wandering around in Tevas, t-shirt, and quick-dry wading pants. Fortunately — more through Homeric serendipity than good planning — conveniently located hot springs would take the edge off the schizoid weather. The Northern Rockies are blessed with one of the world’s greatest concentrations of exceptional trout water and thermal features; a powerful elixir when paired, I would discover. September and October are transition time in the Northern Rockies. One week I was hurling hoppers at the tawny banks of the Yellowstone River on a perfect 80-degree afternoon; the next, climbing west out of Dubois, Wyo., toward 9,658-foot high Togwottee Pass in a white-knuckle blizzard. Caught betwixt and between, this would be a trip of extremes. My fly rod sojourn began promisingly near the Yellowstone, jump-started by a fun family gathering at Chico Hot Springs, downstream from Mammoth. It was summer’s seemingly last flourish — a tease of warm, clear skies — while we lazily lounged around the resort’s hot pools like we were in Cancun. Venerable Chico has long been a favorite because it offers something for everyone with a pulse. Fly anglers who can pull themselves away from Chico’s sybaritic delights find prime Paradise Valley Yellowstone runs minutes away. 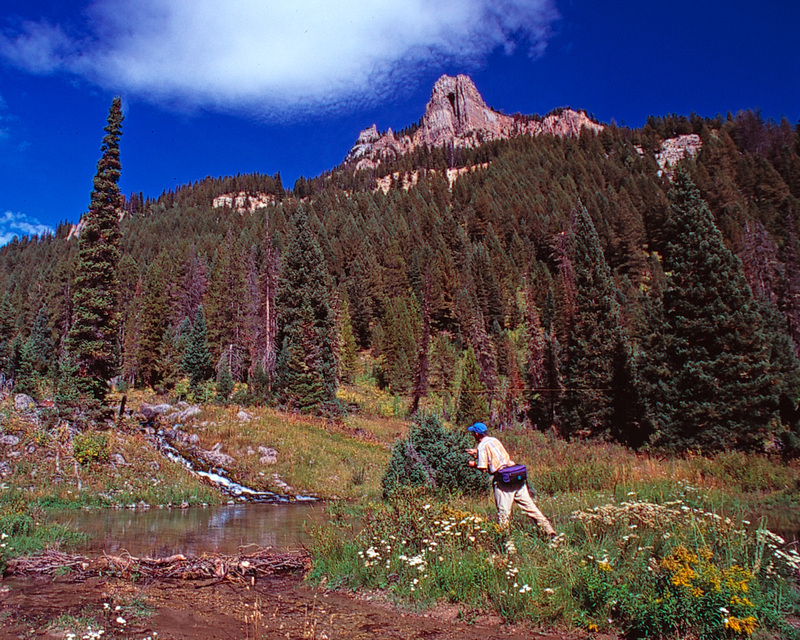 Small stream aficionados can tempt cutthroats in nearby Mill, Pine and Big creeks. Chico’s signature commodity is the natural hot springs water coursing through developed pools in the shadow of the soaring Absaroka Mountains. The smallest and hottest pool (103 degrees) is for soaking; the larger one (96 degrees) is big enough for swimming. Thirsty soakers amble barefoot to the bar window and order an IPA or margarita to help lubricate sore casting joints. Meanwhile, insouciant kids — like my nephew and niece, Ben and Hailey — float away the last of their summer vacations on air mattresses, smiles as wide as the sky. In an America that is increasingly segregated economically, Chico is a happy anachronism where folks of all stripes can agreeably rub shoulders; wealthy investment bankers to fly fishing bums, and everyone in between. Partly, that’s the magic of live-and-let-live Chico culture, but also the salutary effects that hot springs have worked on human psyches and relations for thousands of years. While at Mammoth, I could have exploited fall’s first nasty blow by pursuing large, hook-jawed browns in the Gardner River, which were starting their spawning run up from the Yellowstone. But the lazy time at Chico had temporarily worn off my hard-core angler edge: For two consecutive days, I hiked down the mountainside from Mammoth to the Gardner, not to fish but luxuriate in the Boiling River. In a park packed with wonders, the Boiling River is truly a marvel, one of Yellowstone’s largest, constant thermal discharges. Among other benefits, it provides an unusual opportunity to bathe in the hot water Yellowstone is famous for. Located just south of the Montana border, the Boiling River emerges from its Hades-like subterranean vessel along the banks of the Gardner, after collecting hot water from the Mammoth complex above. Every summer after spring runoff ebbs, returning visitors rebuild rock berms to collect the hot water into pools, where temperatures are moderated by the icy tongues from the Gardner’s flows. Subtle adjustments to one’s position in the current can alter water temperatures by more than 10 degrees. True to the hot springs template, the Boiling River is not only a mixing area for water, but people. Prime season visitors will soak with dozens of folks who have made the half-mile hike: international tourists from India, Japan and Germany; an Iowa farm family; giddy teens from Seattle; and dread-locked hippy backpackers just out of the backcountry. Amidst the fascinating medley of languages, cultures, ages, attitudes and bodies there is one constant: hedonistic delight. It seems oxymoronic that trout — quintessentially cold water creatures — can thrive in an environment heated by so many thermal features. The water gushing from Yellowstone’s fissures is often hot enough to scald human flesh and poach a trout. As proof that the latter is not so far-fetched, early park visitors cooked freshly-caught cutthroats over Fishing Cone, next to Yellowstone Lake. 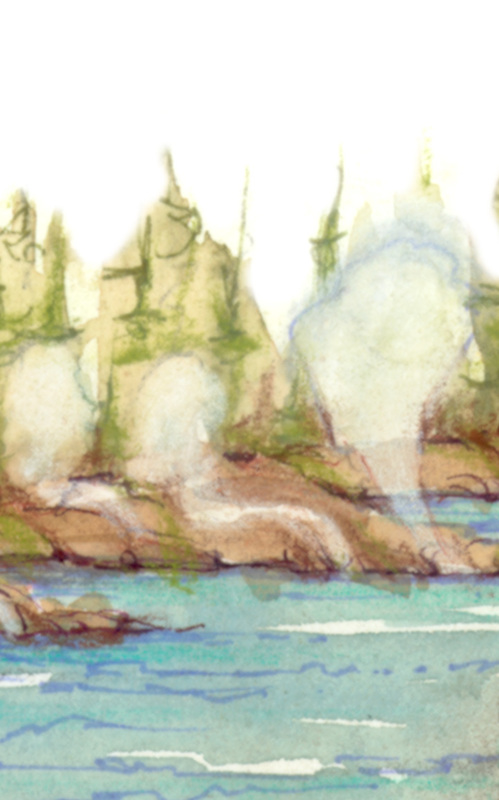 How then, is the Gardner River fishery enhanced by the Boiling River? For starters, the influx of fiery water helps moderate icy winter temperatures, creating more optimum conditions for brown trout eggs deposited in gravel beds the previous fall. And the warmer water keeps fish more active during the winter and shoulder seasons (although the Gardner below the Boiling River can get too warm for optimal summer fishing). But there is one critical additional benefit: Minerals leached out of the earth create a more nutrient-rich environment for the aquatic insects trout feast on. At Mammoth, precipitation falling on the surrounding mountains seeps toward the magma and is heated to approximately 170 degrees, percolating through and dissolving layers of limestone. The calcium carbonate — which precipitates out to form Mammoth’s iconic terraces — is also a building block for creating super-productive aquatic environments. Some of the world’s best spring creek trout water benefits from a food chain enriched by limestone, albeit without the thermal processes. It’s a perfect angling metaphor for the transformative cycle of life: The mineral remains of ancient sea creatures, uplifted over eons, are dissolved by water to enhance today’s aquatic fecundity. Once the cold water begins to receive thermal runoff the biology of the stream changes fast. The most visible change takes place in plant life … The world of the Firehole River below the geyser basins is the aquatic equivalent of a luxurious rain forest. Great numbers of mayflies … are present here … Most of these small creatures help support the impressive populations of trout. Trout have adapted to the extreme heat, altering their spawning regimes and taking summer refuge in cooler tributaries like Iron Spring Creek. Of course, thermal features — like climates — change over time: Shifts in the volume and temperature of hot water entering the river impact fish in ways that are difficult to predict. Anglers and biologists still debate Brooks’ contention that a string of earthquakes in the 1970s raised the Firehole’s temperatures and adversely impacted its fishery. As with the Gardner, the Firehole’s chemistry is profoundly influenced by the thermal features, although in different ways. 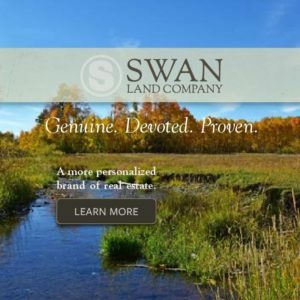 “Probably the most important single factor governing the life types found in a body of water,” say Varley and Schullery, “is the water’s chemistry.” In contrast to limestone-based chalk streams, one of the main Firehole ingredients is a sodium-bicarbonate-chloride mix, helping jumpstart aquatic productivity. One aspect the Firehole shares with limestone streams is registering on the alkaline side of the pH scale. In contrast to more acidic waters, alkaline rivers tend to support a lower diversity of aquatic insects, but greater numbers of each. The Firehole’s complex chemical bounty, while increasingly diluted, carries on downstream to the Madison and even my home river outside Helena, the mighty Missouri with its fat, 20-inch rainbows. If Chico is the mellow grande dame of western hot spring resorts, Thermopolis — Greek for “hot city” — is like an alluring Disneyland: It affords a dizzying, almost Roman-like array of bathing choices and amenities, nearly within casting distance of the fabled Bighorn River. 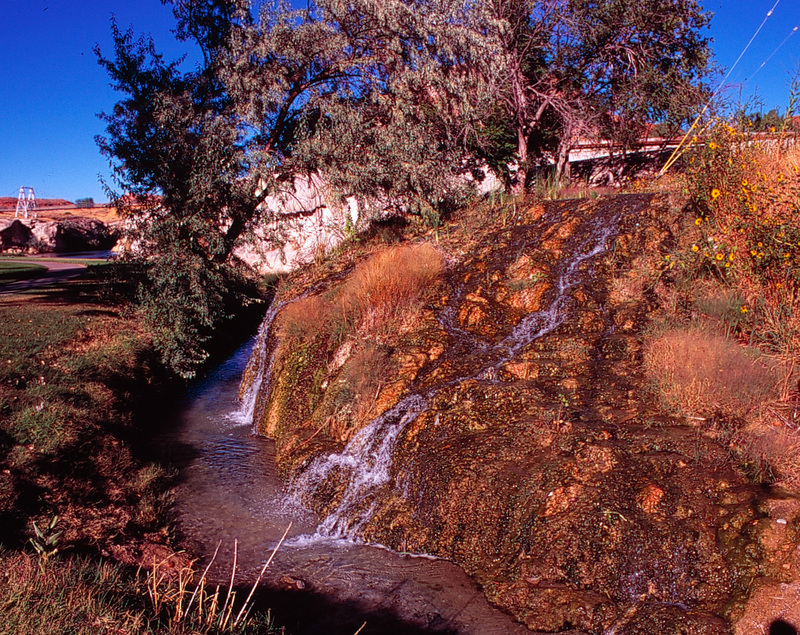 The treasured hot mineral water produced by the Thermopolis springs is divided according to a scheme of Byzantine complexity, allocated between pools run by the state park system, private bath houses, and nearby hotels. I arrived with the intent of warming up before fishing the Wind and Bighorn Rivers. This epic trout watershed is as two-faced as Janus, the ancient Roman god presiding over life’s spring-like portals — transitions, beginnings and ends, the past and future. In one of the great curiosities of river nomenclature, the Wind suddenly morphs to the Bighorn at a place called the “Wedding of the Waters” just upstream from Thermopolis. After rising in its massive namesake range, the Wind is a productive freestone river near Dubois, yields two world-class tailwater reaches below Montana’s Yellowtail Dam and Wyoming’s Boysen Reservoir. The latter slices through the spectacular Wind River Canyon; it’s a massive geological textbook that rips open dozens of chapters of ancient earth history. Irrespective of its name change, the stream remains productive trout water right through Thermopolis. After Yellowstone, Thermopolis is Wyoming’s best known collection of hot mineral springs, ranking among the world’s largest. Precipitation falling on the Owl Creek Mountains south of town infiltrates thousands of feet into the earth and heated to 160 degrees; it then ascends to the surface through fractures, emerging at approximately 130 degrees and laden with more than two dozen minerals. Like Mammoth, the springs have created fantastical calcium carbonate formations, kind of a natural, hallucinogenic cement factory. As at Lolo, the Thermopolis hot springs were enjoyed by Indians: They regarded them as sacred, endowed with miraculous curative properties and the capacity to render warriors invincible in battle. Today, Thermopolis echoes the spa-like bathing houses integral to the cultures of ancient Greece and Rome. During the Roman Empire, sometimes sprawling and luxurious public bathing facilities called thermae — a word borrowed from the Greeks — were gathering places for a cross-section of society to relax in pools of variable temperatures, treat afflictions, socialize, clinch business deals, read, play sports, get a massage, or start a romance. In classical Greece, the Pegaiai were a special category of goddess-like water nymphs Naiades inhabiting springs. Particularly inviting fountains developed cult-like followings, and were often attributed with healing properties. The Pegaiai — portrayed as beautiful young women — were thought to have oracular powers and could confer gifts of prophecy and poetry on bathers. The word hedonistic — derived from the Greek word for pleasure — often gets a bad rap amongst puritanical souls. It’s often equated with what might have happened backstage after a 1970s Rolling Stones or Led Zeppelin concert, or decadence during the waning days of the Roman Empire. But one of the definitions offered by Webster’s defines hedonism this way: “The ethical doctrine that pleasure, variously conceived of in terms of happiness of the individual or of society, is the principal good and proper aim of action.” In principle, I’m guessing few road-tripping, fly rod-toting, hot springs lovers will argue with this: carpe diem. My fire and ice trek was winding down with indigo fall skies and mountain meadow colors as vibrant as a Claude Monet landscape. Afternoons were warm; but under sparkling night skies temperatures were plunging into the 20s. The grasshoppers I had been so dependent on were comatose in the morning and sluggish until noon. My fishing season was approaching its annual autumnal end — but not before netting more comely cutts and one last soak. A tributary to western Wyoming’s Hoback River, Granite Creek rises amidst 11,000-foot high peaks in the Gros Ventre Wilderness Area, winding down toward the hot spring. Below the thermal pool, the stream plunges over Granite Falls, snakes past a pleasant forest service campground, then follows a gravel road for 10 miles to the stream’s terminus in the Hoback River Canyon. Granite Creek shelters a robust population of Snake River fine-spotted cutthroats. One of Wyoming’s five cutthroat subspecies, these native trout inhabit portions of the upper Snake River drainage, including a small piece of Idaho. Of all western cutthroats, these beauties have been the most successful at retaining their indigenous range, which they have done tenaciously on Granite Creek. Anglers shouldn’t expect trophies, but some are sizeable enough to make your reel sing briefly. After a day of tangling with hungry cutts — aware their window for feasting was rapidly narrowing — an evening soak seemed like the piece de resistance. Located 35 miles from Jackson and a mile from the campground, Granite Hot Springs proved the consummate balance between the more developed thermal spas at Chico and Thermopolis, and the primitive Boiling River. In 1933 a Civilian Conservation Corps crew — working for Depression-era wages of a buck a day — constructed a rustic pool to collect the hot water. Today, the springs and adjacent changing rooms are operated by a forest service concessionaire. Water temperatures fluctuate, averaging 93 degrees during the summer and 112 in the winter. The springs are open year around, except during the seasonal transitions when the road is impassible; because the area receives 400 inches of snow annually — helping feed the spring — winter visitors make pilgrimages on skis, snowshoes, dogsleds, and snowmobiles. More fall snow was soon headed my way, but perched at 7,000 feet I luxuriated in summer’s finale and the warm water gushing into the mountainside tarn. Surrounded by wilderness as the sun sank toward the towering Gros Ventre Range, I listened as Granite Creek murmured in the valley below. It was the end of the season, and there were only a handful of others in the pool. A couple of real-life nymphs were draped on air mattresses, floating on the Edenic cloud tops reflected off the water. This was perfection, and we had it all to ourselves. As I drifted on my back gazing contentedly into the expansive sky, another Greek-derived word floated past my mind’s periphery — Elysium: A place or condition of ideal bliss or happiness; pretty much paradise. 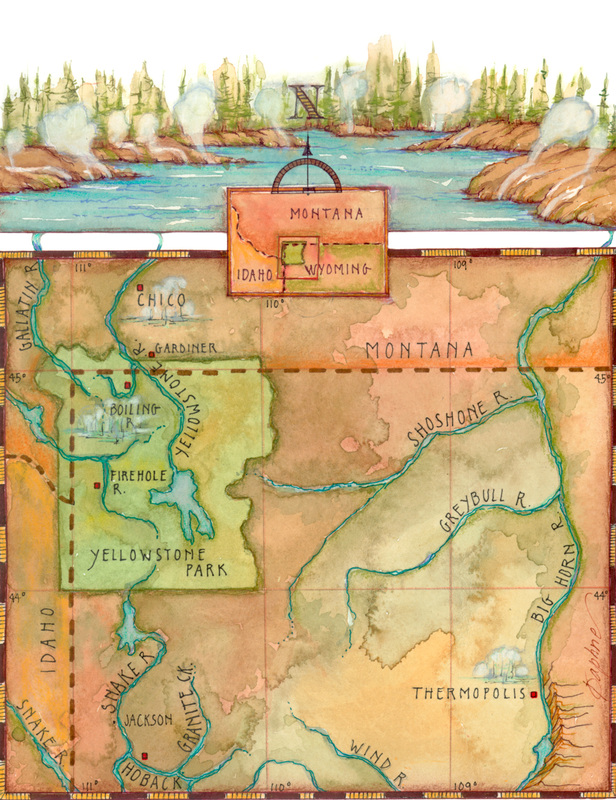 Intrepid anglers could spend several reincarnations pursuing trout/hot spring tandems in the Northern Rockies. Here are leads on how to begin your quest. Boulder Hot Springs and Spa: Near the Boulder River, between Helena and Butte (406.225.4339 or www.boulderhotsprings.com). Chico Hot Springs Resort: Located between Livingston and Gardiner, near the Yellowstone River and various tributaries (406.333.4933 or www.chicohotsprings.com). Fairmont Hot Springs Resort: Near the upper Clark Fork River, between Butte and Anaconda (800.332.3272 or www.fairmontmontana.com). Jackson Hot Springs: In the upper Big Hole River valley (406.834.3151 or www.jacksonhotsprings.com). Lolo Hot Springs: Adjacent to Lolo Creek, in the Bitterroot Mountains (406.273.2290 or www.lolohotsprings.com). Lost Trail Hot Springs Resort: In Sula, near the East Fork of the Bitterroot River (406.821.3574 or www.losttrailhotsprings.com). Norris Hot Springs: North of Ennis, close to the Madison River (406.685.3303 or www.norrishotsprings.com). Quinn’s Hot Springs Resort: Close to the lower Clark Fork River, near Paradise (406.826.3150 or www.quinnshotsprings.com). Boiling River: On the northern edge of Yellowstone National Park, near Mammoth Hot Springs and the Gardner River (307.344.7381 or www.nps.gov/yell). Granite Hot Springs: Run by a concessionaire (307.734.7400), along Granite Creek in the Bridger-Teton National Forest (www.fs.usda.gov/btnf). There are also more primitive pools beneath Granite Creek Falls. Hobo Hot Pool: On the banks of the North Platte River, in Saratoga (307.326.8335 or www.saratogachamber.info). 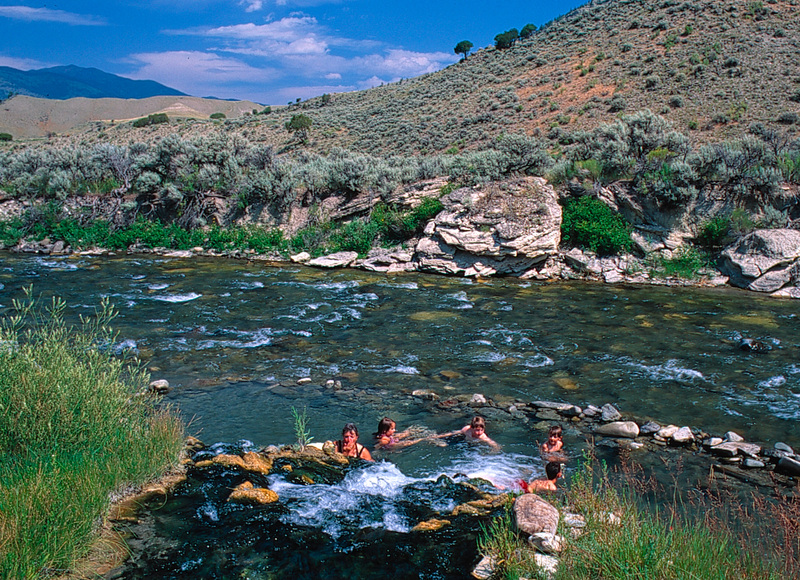 Thermopolis: Featuring a plethora of bathing options, along the Bighorn River (877.864.3192 or www.thermopolis.com). Like Mammoth’s travertine terraces, the Thermopolis hot springs have created fantastical calcium carbonate formations, kind of a natural, hallucinogenic cement factory. A tributary to western Wyoming’s Hoback River, Granite Creek rises amidst 11,000-foot high peaks in the Gros Ventre Wilderness Area. Below the thermal pool, the stream plunges over Granite Falls, then follows a gravel road for ten miles to the stream’s terminus in the Hoback River Canyon. Granite Creek shelters Snake River fine-spotted cutthroats. 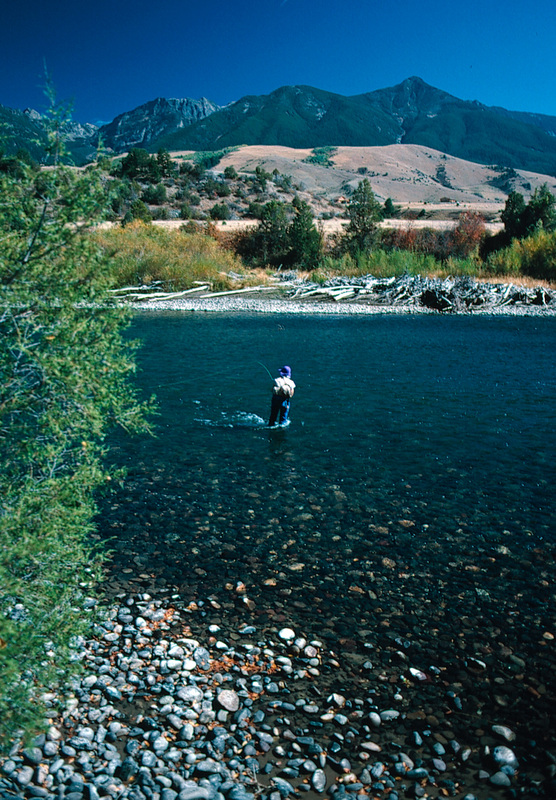 Fly anglers who can pull themselves away from Chico’s sybaritic pleasures find prime Yellowstone River runs minutes away in the Paradise Valley. Small stream aficionados can tempt Yellowstone cutthroats in Mill, Pine and Big Creeks, all easy day trips from Chico. In a park packed with wonders, the Boiling River is truly a marvel, one of Yellowstone’s largest, constant thermal discharges. Among other benefits, it provides an unusual opportunity to bathe in the hot water Yellowstone is famous for, along the banks of the icy Gardner River.